Login to consign, volunteer and more! Sign up for a new account! Little Feet accepts cash, check and major credit cards. Shoppers can bring strollers/wagons to use as a shopping cart. Be sure to visit the Tea Room for complimentary refreshments! 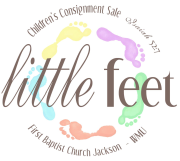 Here you can learn more about the ministries of Little Feet and First Baptist Church - Jackson! Click here for a printable flyer you can give to a friend.